A covalent post-translational modifications (PTM) to histone proteins, also known as histone modification, regulate gene expression by organizing the genome into active regions of euchromatin or inactive heterochromatin regions. Euchromatin is a place where DNA is accessible for transcription, and inactive heterochromatin regions is a place where DNA is more compact and less accessible for transcription. As mentioned in the article of "What a Powerful Artifact of DNA Compression", histone proteins act to package and order DNA, which wraps around the eight histones, into structures called nucleosomes so that it fits within a cell's nucleus. Each nucleosome consists of two subunits, both made of histones H2A, H2B, H3 and H4, also known as core histones, with the linker histone H1 acting as a stabilizer. Histone modifications act in diverse biological processes such as transcriptional activation/inactivation, chromosome packaging, and DNA damage/repair. Histone modification often includes methylation, phosphorylation, acetylation, ubiquitylation, and sumoylation, as the figure 1 shows. Histone methylation is the modification of certain amino acids in a histone protein by the addition of methyl groups. It causes transcription repression or activation, depending on the target sites. Histone methyltransferases (HMTs) control or regulate DNA methylation through chromatin-dependent transcription repression or activation. Methylation and demethylation of histones turn genes on and off in DNA. Each one of the core histone proteins has a tail extension, and these tails are the targets of nucleosome modification by methylation. DNA activation or inactivation is largely dependent on the specific tail residue methylated and its degree of methylation. Histones can be methylated on lysine (K) and arginine (R) residues only, but methylation is most commonly observed on lysine residues of histone tails H3 and H4. Lysines can be either mono-, di-, or tri-methylated, forming functional diversity to each site of methylation. For instance, both mono- or tri-methylation of K4 (H3K4me1 or H3K4me3) are active marks, but H3K4me1 is found at transcriptional enhancers, while H3K4me3 is found at gene promoters. Tri-methylation of K36 (H3K36me3) is associated with transcribed regions in gene bodies. Tri-methylation of K9 and K27 on histone H3 (H3K27me3 and H3K9me3) are both repressive signals, however, H3K27me3 is a temporary signal that controls development regulators. Conversely, H3K9me3 is a permanent signal for heterochromatin formation of chromosomal regions with tandem repeat structures . Here, we list part of CUSABIO methylated histone antibodies on the table 1. Histone phosphorylation has been implicated in numerous processes such as transcription, DNA repair, cell cycle progression and apoptosis, and chromosome condensation. The best-known function of histone phosphorylation takes place during cellular response to DNA damage, when phosphorylated histone H2A(X) demarcates large chromatin domains around the site of DNA breakage . Histone phosphorylation can occur on serine, threonine and tyrosine residues and constitutes an essential part of the "histone code," or combinatory function of PTMs on chromatin. Phosphorylation of histones can also be an important regulatory signal. Histone H3 phosphorylation is known to play important roles in both transcription and chromosome condensation during mitosis. Histone H2B phosphorylation condenses the chromatin and is involved in apoptosis. Phosphorylation of H2A and H4 occur, but the downstream effects of phosphorylation of these subunits are unknown  . Here, we list part of CUSABIO phosphorylated histone antibodies on the table 2. Histone acetylation is triggered by the enzymatic addition of an acetyl group (COCH3) from acetyl coenzyme A. The process of histone acetylation is closely involved in the regulation of many cellular processes, including chromatin dynamics and transcription, gene silencing, cell cycle progression, apoptosis, differentiation, DNA replication, DNA repair, nuclear import, and neuronal repression. But the most common function of histone acetylation is associated with an open chromatin structure. This makes chromatin accessible to transcription factors and can significantly increase gene expression. Histone acetylation is largely targeted to promoter regions. For example, acetylation of histone H3 and histone H4 is involved in the regulation of chromatin structure and the recruitment of transcription factors to gene promoters. Histone acetyltransferases (HAT) and deacetylases (HDACs) are the enzymes responsible for writing and erasing the acetylation of histone tails. Lysine residues within histone H3 and H4 are preferential targets for HAT complexes. Here, we list part of CUSABIO acetylated histone antibodies on the table 3. Histone ubiquitination, one of the histone post-transcriptional modifications, has been discovered for more than three decades. As histones are the most abundant ubiquitinated proteins, their ubiquitination plays critical roles in many processes in the nucleus, involving transcription, maintenance of chromatin structure, and DNA repair. Monoubiquitination of H2A and H2B have been clearly implicated in transcriptional regulation. H2Aub occupation is more frequently correlated with gene silencing, while H2Bub is mostly associated with transcription activation . In addition to transcription regulation, monoubiquitinated H2B is also required for chromatin function via other ways. H2Bub has the role of chromatin boundary integrity, and loss of H2Bub leads to the spreading of other histone modifications . H2Bub is also shown to play an important role in homologous recombination through chromatin remodeling by recruiting chromatin remodeling factors. Cells lacking RNF20 or expressing H2B K120R, which lacks ubiquitin conjugation site, exhibit defects in HRR . In addition to polyubiquitination, monoubiquitination of histones H2A, H2B, and H2AX also occurs at the sites of DNA damage. Besides the histone modifications mentioned earlier, there also have several other histone modifications, such as sumoylation and Biotinylation. Histone sumoylation, as an example, is a post-translational modification directed by an enzymatic cascade in which Small Ubiquitin-like Modifier (SUMO) proteins are attached to or detached from other proteins to change their function in cells. Detection of SUMO conjugation or protein sumoylation can help researchers understand how this modification plays a role in regulating nuclear protein activity and in certain cellular processes, such as transcriptional regulation, apoptosis, nuclear-cytosolic transport, response to stress, protein stability, and progression through the cell cycle. 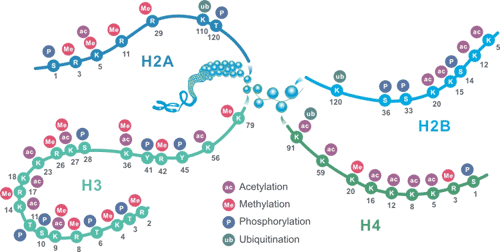 Greer, E. L. & Shi, Y. Histone methylation: a dynamic mark in health, disease and inheritance [J]. Nat. Rev. Genet. 2012, 13, 343–57. Ye Zhang, Karen Griffin, et al. Phosphorylation of Histone H2A Inhibits Transcription on Chromatin Templates [J]. J Biol Chem. 2004, 279(21):21866-72. Berger, S. L. Histone modifications in transcriptional regulation [J]. Curr. Opin. Genet. 2002, Dev. 12, 142–148. Wang L. Cheung, Kozo Ajiro, et al. Apoptotic Phosphorylation of Histone H2B Is Mediated by Mammalian Sterile Twenty Kinase [J]. Cell. 2003, 113, 507–517. Zhou W., Zhu P., et al. Histone H2A monoubiquitination represses transcription by inhibiting RNA polymerase II transcriptional elongation [J]. 2008, Mol. Cell 29, 69–80. Ma MK, Heath C, et al. Histone crosstalk directed by H2B ubiquitination is required for chromatin boundary integrity [J]. PLoS Genet. 2011 Jul; 7(7):e1002175. Nakamura K, Kato A, et al. Regulation of homologous recombination by RNF20-dependent H2B ubiquitination [J]. Mol Cell. 2011, Mar 4; 41(5):515-28.